Notes: The NX range of power amplifiers pack large Wattages into exceptionally lightweight and rack-mountable packages. And because the NX range is so much more efficient than conventional designs, they run cooler and don't require the massive heat sinks and heavy toroid transformers typically associated with their conventional counterparts. Thanks to our 'Zero-Attack' limiters that offer maximum output level with exceptionally-reliable overload protection and SmartSense Loudspeaker impedance compensation, which provides fully linear frequency response at any speaker load impedance, you can run the NX range full-out for hours on-end. Our revolutionary high-density Class-D technology, combined with an ultra-efficient, switch-mode power supply ensure these feather-light powerhouses will drive your rig effortlessly for many years to come. Thanks to our High-Density Class-D amplifier Technology, we are able to provide you with enormous power and incredible sonic performance in an easy-to-use, ultra-portable and lightweight package. Class-D amplification makes all the difference, offering the ultimate in energy efficiency and eliminating the need for heavy power supplies and massive heat sinks. This amazing technology makes it possible to design and build extremely powerful products that are significantly lighter in weight than their traditional counterparts, while using less energy and protecting the environment. The front panel controls and indicators provide your systems vital signs at a glance. After pressing the Power button, the Power LED lights to show the amp is ready for action. All channels feature positive-detent Gain controls with Signal LEDs that light when a signal is present, as well as Limit LEDs to indicate when the amplifier is running at full capacity. Just as elegant as the front, the rear panel is home to the combo XLR and 1/4" TRS Input connectors, making the NX range compatible with virtually any source, balanced or unbalanced. Professional twist-lock speaker sockets are provided to ensure every drop of output power gets to your loudspeakers. The rear panel is also where you'll find the switches that enable the NX amp range to run in your choice of dual mono, stereo or mono bridge modes. The ranges built-in Crossover switch sets the amp to Full-Range mode, where the output is sent unfiltered to your loudspeakers, or Bi-amp mode, which sends only the low-frequency content (<100 Hz) to passive subwoofers, while the high-frequency content (>100 Hz) is channelled to your full-range loudspeakers. Our new SmartSense Technology puts the punch back into Class-D amplification, providing vastly improved full-range frequency response with more powerfully-dynamic bass, and smoother high-frequency reproduction. The resulting output is no longer dependent on the actual load, but is rendered perfectly ruler flat via impedance compensation. NX's design also incorporates a significantly-higher damping factor that yields better amplifier control over the loudspeaker for stronger audio reproduction especially in the LF area. Sporting massive output ratings, lightweight Class-D technology and an equally lightweight price tag plus all the amenities a professional audio engineer could ask for the BEHRINGER NX range of power amplifiers are serious amps for your most demanding applications. Notes: The NX amplifier range with DSP packs large wattages into exceptionally lightweight and rack-mountable packages. Plus, the built-in DSP and 24-bit/96 kHz converters ensure the ultimate signal integrity with an extremely broad dynamic range. And because the NX range is so much more efficient than conventional designs, it runs cooler and doesn't require the massive heat sinks and heavy toroid transformers typically associated with its conventional counterparts. Thanks to our 'Zero-Attack' limiters that offer maximum output level with exceptionally-reliable overload protection and SmartSense Loudspeaker impedance compensation, which provides fully linear frequency response at any speaker load impedance, you can run the NX range full-out for hours on-end. Our revolutionary high-density Class-D technology, combined with an ultra-efficient, switch-mode power supply ensure this feather-light powerhouse will drive your rig effortlessly for many years to come. The front panel controls and indicators provide your systems vital signs at a glance. After pressing the Power button, the Power LED lights to show the amp is ready for action. All channels feature positive-detent Gain controls with Signal LEDs that light when a signal is present, as well as Limit LEDs to indicate when the amplifier is running at full capacity. Just as elegant as the front, the rear panel is home to the combo XLR and 1/4" TRS Input connectors, making the NX range with DSP compatible with virtually any source, balanced or unbalanced. Professional twist-lock speaker sockets are provided to ensure every drop of output power gets to your loudspeakers. For sound engineers requiring high-level control capability, the NX range amplifier comes ready for action right out-of-the-box. 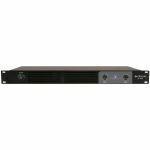 The built-in DSP and 24-bit/96 kHz converters ensure the ultimate signal integrity with an extremely broad dynamic range. DSP section features sophisticated delay, crossover (3 filter types, up to 48 dB/octave), EQ (8 parametric, 2 dynamic), dynamics processing and lockable security settings. A convenient front panel LCD display allows you to setup and make adjustments directly at the amplifier, without the need for a PC. Our new SmartSense Technology puts the punch back into Class-D amplification, providing vastly improved full-range frequency response with more powerfully-dynamic bass, and smoother high-frequency reproduction. The resulting output is no longer dependent on the actual load, but is rendered perfectly ruler flat via impedance compensation. The NX ranges design also incorporates a significantly-higher damping factor that yields better amplifier control over the loudspeaker for stronger audio reproduction especially in the LF area. You can also set up, control and monitor your amplifier using your computer via USB and immediately gain access to a whole new level of amplifier control. NX EDIT is the ideal way to manage installed systems, and to create custom presets for live sound and production environments. 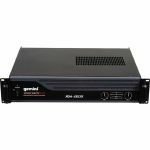 Notes: The XGA-2000 amplifier offers clean, reliable power in a durable, lightweight enclosure. If you demand professional amplification performance, the XGA-2000 is perfect for delivering pure, consistent wattage night after night. With 2000 watts of Instant Peak Power (250 watts RMS), the XGA-2000 is ideal for powering PA systems and DJ rigs. To ensure seamless, reliable performance, the amp features front-to-rear airflow and a cooling fan for thermal stability, DC output protection and short circuit protection. For true connecting convenience, the XGA-2000 boasts XLR and 1/4-inch balanced inputs and three Speakon outputs. The unit also provides front panel indicators for Signal, Clip, Protect and Bridge, plus level controls for channels 1 and 2. Selectable modes for Stereo and Mono Bridge give you even more flexibility, while its sleek, lightweight design ensures total portability. With clean, dependable power in a resilient, 17-pound enclosure, the XGA-2000 offers unmatched value for anyone who is serious about sound. Notes: Clean, reliable power in a durable 17lb enclosure. If you demand professional amplification performance, the XGA-3000 is perfect for delivering pure, consistent wattage night after night, year in and year out! This system brings 3,000 watts of Instant Peak Power making it ideal for PA systems and DJ rigs. We’ve designed this with our patented front to rear airflow technology powered by a variable speed thermal stabilizer to guarantee seamless, reliable performance every single night! Our XGA-3000 offers clean, dependable power in a lightweight body at an unmatched value. Notes: Clean, Reliable Power in a durable 17lb enclosure. If you demand professional amplification performance, the XGA-4000 is perfect for delivering pure, consistent wattage night after night, year in and year out! This system brings 4,000 watts of Instant Peak Power making it ideal for PA systems and DJ rigs. We’ve designed this with our patented front to rear airflow technology powered by a variable speed thermal stabilizer to guarantee seamless, reliable performance every single night! Our XGA-4000 offers clean, dependable power in a lightweight body at an unmatched value.